In June 2006, I was delighted to return to Mongolia with my friend and fellow St. Barnabas parishioner Carol Gregory, to help organize the First International Quilt Exhibition in Mongolia and continue work at the NWL Mongolian Quilting Center. 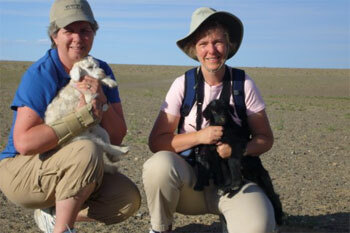 Carol and I arrived in Mongolia in mid-June and spent 12 days on an amazing adventure traveling to the Gobi Desert and Central Mongolia. Selenge was our guide and led us to many places of outstanding beauty. A highlight was riding camels in the sand dunes and climbing 1,200 feet to the top of a sand dune peak at sunset for a view of a life-time. Central Mongolia was lush and green, with carpets of wildflowers. We were welcomed by nomadic families and sampled an interesting variety of dairy products including milk tea, camel cheese, yak yoghurt, and airag (beer made from fermented mare's milk)! When we returned to Ulaanbaatar, we had two weeks to prepare for the exhibition, and Patricia Hartman, from Pennsylvania, arrived to help us. The exhibition took place on the fourth floor, the furniture section, of The Department Store in the heart of Ulaanbaatar. We spent time studying the layout for positioning the quilts, constructing posters in Mongolian and English for display at the exhibition, making labels for all the quilts, and publicity work. We had a wonderful group of about 15 Mongolian women who volunteered to help us hang and man the exhibition, and handle the sales of patchwork and quilted items. Selenge had achieved an impressive amount before we arrived, assisted in May by Klina Dupuy, from Bellevue (USA), who spent three weeks helping with the planning and logistics. I appeared on Mongolian National TV, was interviewed for an article in the Mongolian Daily News, and was on a one hour radio talk show with Selenge and Tsogzul. We were invited to participate at a 4th of July celebration hosted by the American Embassy. This gave us an excellent opportunity to tell the international community about the upcoming exhibition as well as being able to sell Mongolian quilts, aprons and bags, and chances on the Ölzii raffle quilt. 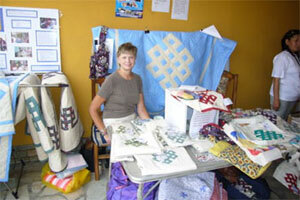 Between all these activities, I was able to teach a couple of classes to women at the Basement Quilting Center. The exhibition lasted for three days, 8-10th July, and was extremely successful. This was an ideal time, immediately before the start of the Nadaam holiday and special celebrations this year for the 800th anniversary of the rise to power of Chengis Khan. Click here to see pictures. There were many Mongolians and tourists in town. We were joined by quilting teacher Lesley Coles and her sister Jane Grendon from the United Kingdom, and Yuri Fukunaga and Chiyeko Ishigouoka from Japan. The UK Quilters' Guild donated 16 quilts and I took 20 quilts donated by quilters in the US. The Japanese ladies also brought quilts to share at the exhibition. These were all displayed alongside the Mongolian quilts. I was amazed at the creativity of the Mongolian women, who have such limited resources. Two years after starting from scratch, they were making beautiful Ölzii quilts stitched with care and enthusiasm. 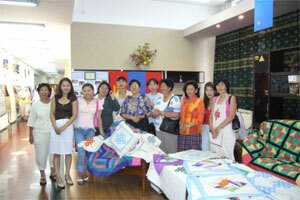 The exhibition was well received and many Mongolian women became interested in learning to quilt. We were able to promote the activities of the New Way Life Mongolian Quilting Center, educate Mongolians about quilting, establish many useful contacts, and raise money from the sale of quilts, aprons and bags. Many thanks to the quilters who donated their beautiful quilts and helped make this international exhibition possible. 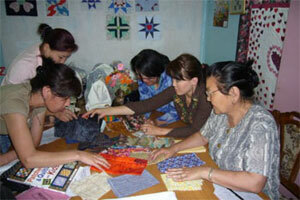 The Mongolian quilts were made by women at the New Way Life Mongolian Quilting Center. From USA: Maggie Ball, Dianne Coombs, Klina Dupuy, Donna Endresen, Maria Groat, Judy Irish, Chris Johnson, Cynthia Keim, Lois Nay, Carrie-Sue Nesvog, Bonnie Norrix, Sue Pilarski, Sheila Quentin, Wanda Rains, Gladys Schulz, Carolyn Tobin, Linda Tellesbo, and AnitaWebb.From UK: Carole Baker, Margaret Beaumont, Sue Curr, Lesley Coles, Carol Dean, Judy Jackson, Lea Lundy, Linda Mowbray, Wendy Wheeler, Ann Woolgar, and the Children of Bethel Chapel Junior Church. From Japan: Shizuklo Kuribayasashi, Midori Kubota, and Naomi Nakamura. Our goal for fundraising was to reach $3,600, the amount necessary to pay for a year of rent for the Mongolian Quilting Center in a new, improved location. The Center was still located in the basement of an apartment block which had flooded three times, had no natural lighting and inadequate heating. We succeeded in our goal - the money raised from sales at the exhibition, together with funds raised in the UK by Lesley and Jane amounted to just over $4,000. Additional funds raised in the USA were used for operating and maintenance. Selenge found a place for the new Center and moved in September. The new Center had a classroom and a small retail space. They continued to use the basement for storage and as a sewing area for two or three women employed to items for sale. At this time, the Center had three part-time teachers (in addition to Selenge) and three seamstresses making quilts, aprons and bags to sell. They marketed the items directly from the Center and at The Department Store.